I think I've pared it down to 1,000 photos, all of which have now been categorized into subject-themed folders, ready to be run through Photoshop, because somebody is never going to learn how to hold a camera still. Ree of Pioneer Woman recently reminded her readers that you should turn your body into a tripod, holding the camera then squeezing your elbows together. I've tried that. It's a squishy, jiggly endeavour - not recommended. Rather than the usual attempts at half-assed narrative, I'm going to cover our EXCELLENT cruise on the Carnival Splendor one aspect at a time. That we'll start with food is just a big DUH. 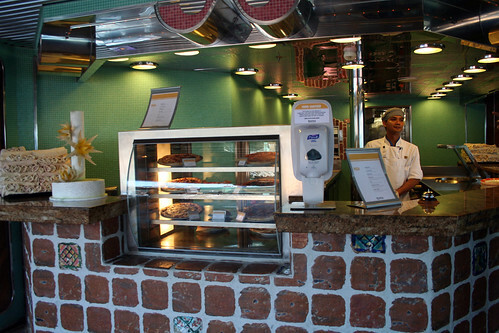 We were so excited that the Splendor had a Tandoori Grill. Indian cuisine? Every day? Take me now, Jayzus. 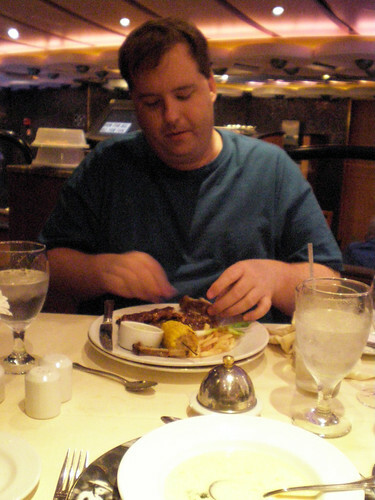 While Mike was up investing in a soda card (we had $240 of promotional onboard credit to be all splurgy about), I sat with our freshly piled plates, gazing out at the Queen Mary docked starboard-side, and updated my Facebook status: "Shari is favoured by the gods. Her ship has an Indian buffet!" 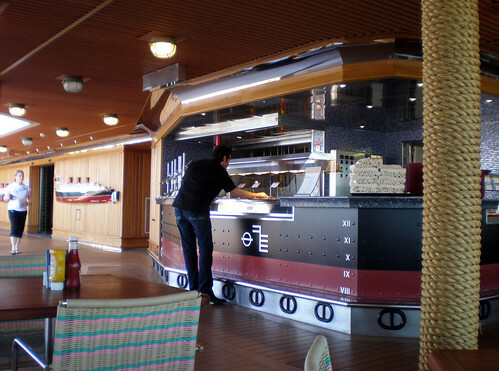 As you can see by the photo of the grill above, the decor on the aft side of the Lido is a clear homage to the lovely QM. (The models on the wall are of that ship and the Normandie.) We'd embarked at a leisurely hour (one-ish), dropped off our luggage (all carry-ons, to the repeated amazement of both crew and Customs), and now we were close to our happy memories of the Queen Mary with plates full of paneer, naan, and butter chicken for Mike. So, what a shame that it was all so dry-dry-dry, and what wasn't as bland as muck was as acrid and heavy-handed as... all get out. 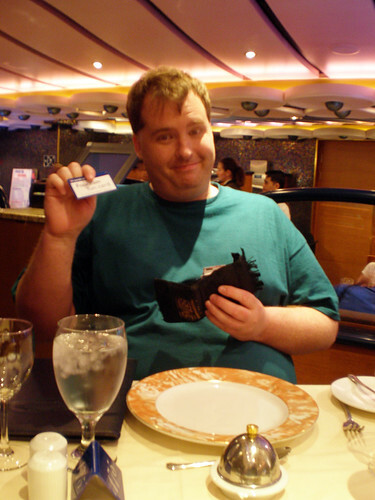 But this was the only true culinary misstep, and now that it's out of the way, let's talk about the good stuff, like Mike with his soda card, pictured above. We knew from the last cruise that the lemonade is really good, but like I said, we had the credit, so it was nice to have the variety now and again. We never cheated and got an extra soda for me from another bartender (you can have all you want, but one at a time, and it will only be served to you - at least on that first day when they're checking cards), but Mike did give his sodas to me now and again. Scandalous, I know. You can use the card in the bars and dining room, but be advised that the roving bar staff will out-and-out ignore you once they learn that this is all you're drinking. Can't complain, though. They're supposed to charge a 15% gratuity to your Sail & Sign card (which is your ship's ID and the only form of money they take on board) every time you use it, but we weren't charged a thing. 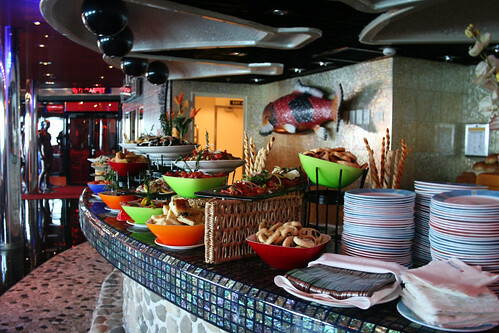 Actually, before we went to the Indian grill, we stopped by the maitre d's station at the Black Pearl on the fourth floor. 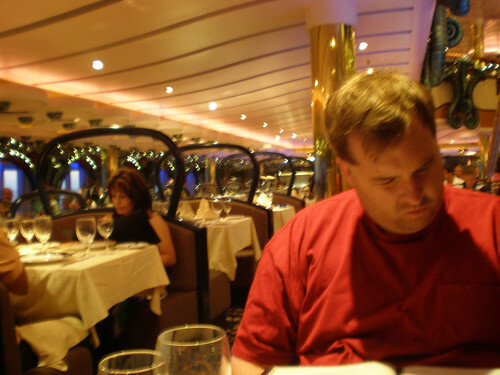 We were ready to beg for a table for two, being "antisocial" or "romantic," depending on which "cruise critic" camp you listen to. No need, though: we'd already been assigned our own cozy table. Hallelujah! Later, Mike talked to Miguel, our personable maitre d', about how pleased we were to have our own table, what were the odds were, etc. Miguel pronounced us "bloody lucky." Take note, anyone who reads certain popular message boards and is led to believe that a) all nice, normal people want to eat at tables for 10 and meet people (shudder), and b) that it's easy to change to a table for two if you like. Anyway. 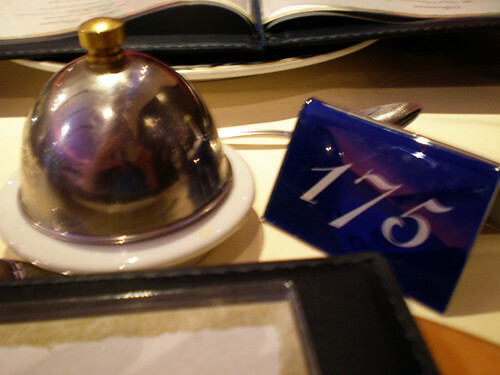 Good ole #175. The perfect furniture for your own little world. So, guess what the vegetarian entree was for that first night? Indian! 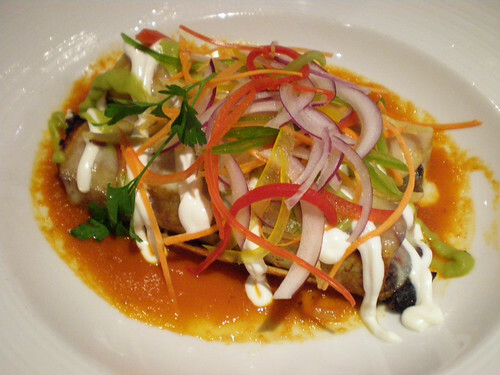 Luckily, it was even better than the Indian dinner on Elation (this time the stuffed bread - kulcha? not naan - had more onions and flavour). 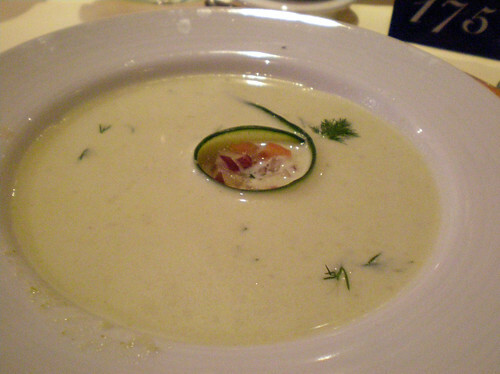 I tried six soups on this cruise: Chilled Cucumber with Dill, Orange Cream (no picture, alas - tasted like a Dreamsicle, though), Cream of Sun-Ripened Tomato, Cream of Potato, Wild Mushroom Cream, and Mango Cream, Of these six, the chilled cucumber was the best. What I really liked was how the soup bowl arrived empty at the table, just a curl of cucumber at the bottom with a few onions inside the loop. Then the waiter (Yumadi, great fellow) brought a small porcelain pitcher to the table and poured the cold soup around the cucumber until it filled the bowl and, eventually, rose up through vegetable circlet (here note my great restraint in not calling it a "crop circle"). I can usually take or leave cucumbers, but this was nicely seasoned, and it was great to have the scent of the dill in my nose as I let the soup wave around the onions crunching between my teeth. I wish I could explain it better; you'd think I'd have picked up something from reading Ruth Reichl (Comfort Me with Apples) this past week. 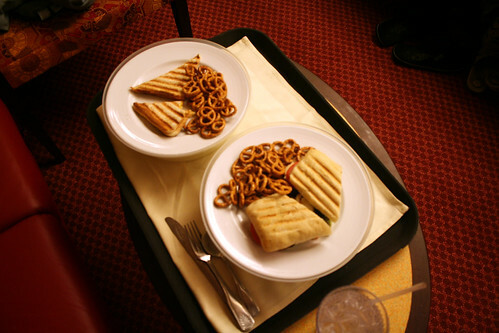 We only got Room Service once, but at least it redeemed the nearly inedible experience we'd had on Elation. Seen above is my signature meatless Reuben, plus the grilled mushroom sandwich. 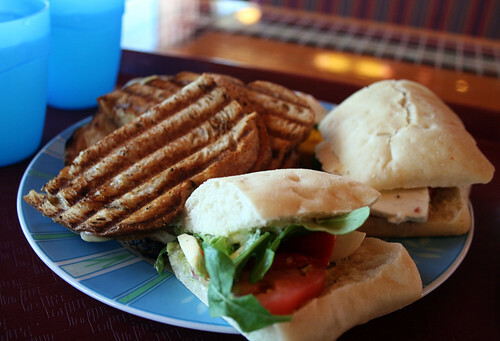 When I'd go to the sandwich grill, I'd swap the mushroom sandwich for the arugula/mozzarella/tomato. I do love sandwiches. 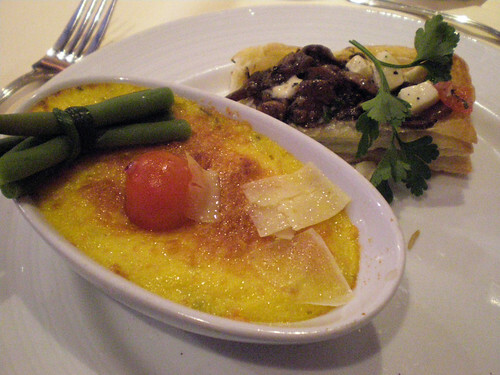 The third night was a the herb polenta with wild mushroom ragout. Highly recommended. The Elation had better pizza. This pizza had a less pillowy (yet not thin) crust and the cheese congealed pretty quickly. We learned right away to always request a fresh slice. As mentioned in the Elation trip report, whether Carnival has good pizza is a huge topic of debate on some boards. Looks like they need to factor in that quality varies from ship to ship. The pizza guy, though, was very nice. I suspect cheaper ingredients are used to serve the bigger Splendor, but that's a totally baseless guess. I did like that the pizza station was right by the main pool on the Lido deck, and not in the back of the Tiffany buffet area, as on Elation. 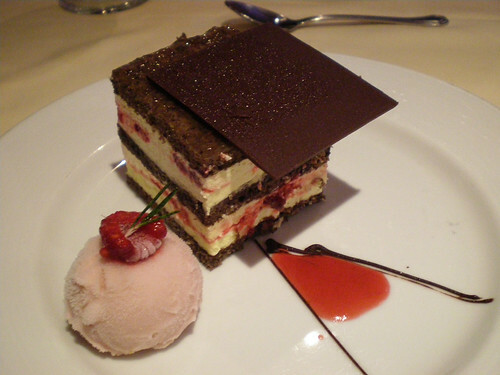 Lunch was very good for me: the aforementioned orange cream soup, "hay and straw" (a mix of egg and spinach fettucinis with cream and cheese), a tropical fruit terrine. Alas, cruising seems to be the one thing that keep me (relatively) camera-free. Unfortunately, there was no vegetarian option for lunch the next day, and on the last day that dining room lunch was available (it's not available on port days), nothing on the menu spoke to us. 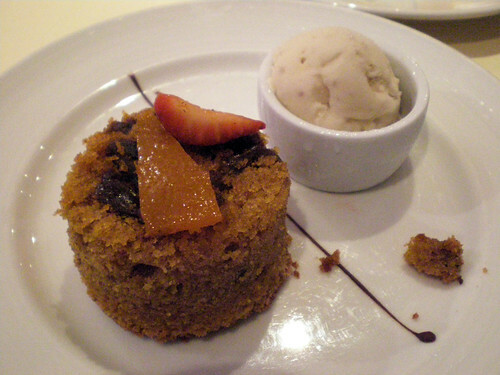 That's a Jerked Pork Loin, which he followed with Strawberry Cheesecake, but I was bolder and had the Warm Fig, Date, and Cinnamon Cake, served with Rum Raisin Ice Cream. 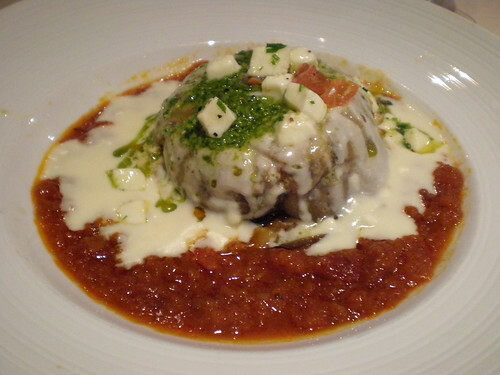 This dish caused me to use the word "pairing" in a completely un-mocking way. The two items were well suited to one another. One thing we didn't know about before boarding was that the Splendor has a burrito bar. Wow! The first time, this didn't go well. The person assembling the burrito put tons of hot sauce on Mike's before he could stop them, plus it was a whole wheat tortilla. (I know it's cool to hate white flour, but people love it for a reason. Anyway, I'm better than the rest of you because I love corn tortillas best, so there!) The second time Mike got a better burrito, but it was still dry. 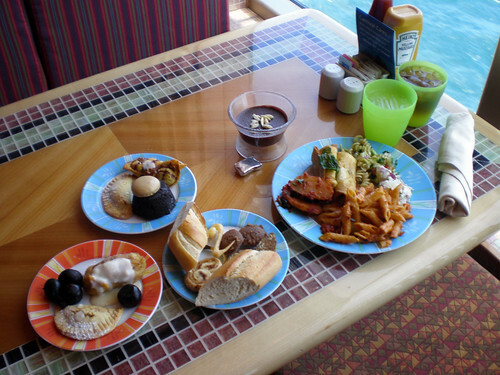 Dryness of the mass-served food seemed to be a recurring problem on Splendor, one that we didn't get on Elation. But isn't that a pretty view of Puerto Vallarta outside the window? (Don't look at the lemonade thief. Don't look at the lemonade thief.) I also liked the way Splendor had many booths and semi-booths, instead of mostly tables like on Elation. 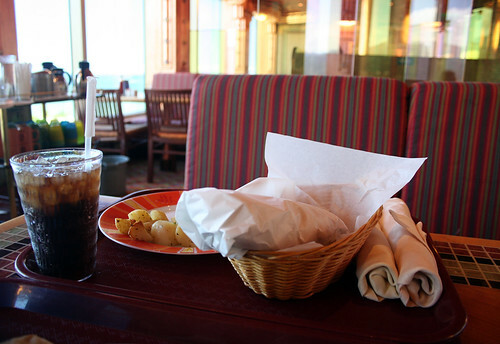 Suffice to say that we got more than our money's worth in gorgeous views while dining. I guess I did okay, huh? Pictured elsewhere on the table is a chocolate mousse with toasted almonds (great), some Chilean empanada-style things with something sticky inside (meh), rum balls (meh), crispy cookie-like "swans" (pretty), a rummy cupcake with macaroon (meh), biscotti (odd, interesting), more sticky stuff (meh), chocolate wontons (definitely interesting), and I forget what else because just typing about it has made me all dizzy from the sugar. Mmmm. Beautiful to look at and a perfect fusion (gack! I said another foodie buzzword!) of chewiness and spice. I even ate the guacamole because it was so pretty. Chopped and Iron Chef (and my Dad) are right: presentation counts. 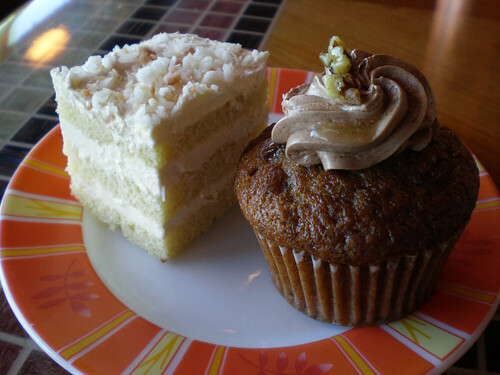 One time I did not get bold in the dining room was when I avoided the Coconut Cream Cake. Why? Because it was a "Spa Selection" (read: light) and made with Splenda instead of sugar. 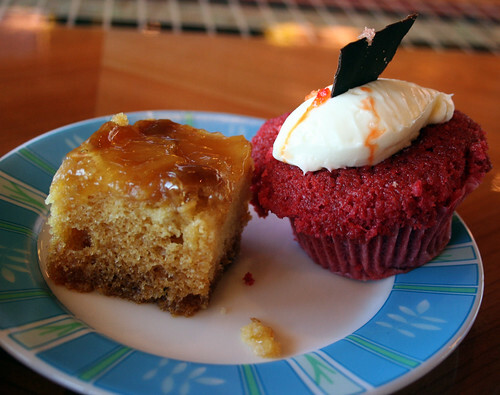 The next day, the cake showed up on the lunch buffet and I just had to try a bite. I got three other desserts, including this yummy banana-chocolate thing. They went almost untouched. The cake, I scarfed. Not only couldn't I tell that it had Splenda, but it was just incredibly delicious. So, I must eat my words. My scrummy, scrummy, coconutty, creamy words. 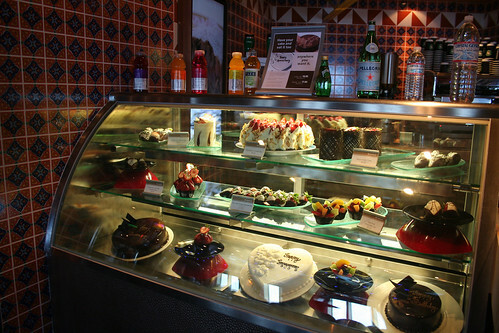 Up on the fifth deck, not far from the pastry counter, is the sushi stand. We never actually saw it open with sushi, though, which probably says a lot about how much we loved our balcony room. (Plenty of people like their inside cabins, but I think these are the same people that like eating with other people at dinner.) The ocean was our television, a marathon of our new favourite show. One event that we missed the first day (went to see the Newlywed Game-style show - hilarious), caught and loved the second day, and forewent the last day (being lazy and not wanting to mar our memories) was Tea Time. Then the trolley came around and, oh, how I will always regret not throwing myself bodily upon the thing. But no, we were dainty, taking a thinly pressed cucumber sandwich and a couple of bite-size scones each. Again with the incredible cucumber moments! Even Mike has since wondered aloud how we might make such little sandwiches on our own. But the scones. Oh. my. "This is a scone," said Mike. "None of that big triangle business that you get here." And he was right. I've only been to England once, only had scones there once, but this was a scone. Full of real cream and so moist... and I don't really see how I'm supposed to carry on, maybe never having such a thing again, and yet I bravely do. Although sometimes, around three p.m., I have to have a bit of a lie-down so I can weep quietly until the loss passes. Soldiering on, for our last meal, I got the Eggplant and Zucchini Parmigiana, which was hearty and pleasantly seasoned, and not floppy at all, as these things sometimes are. 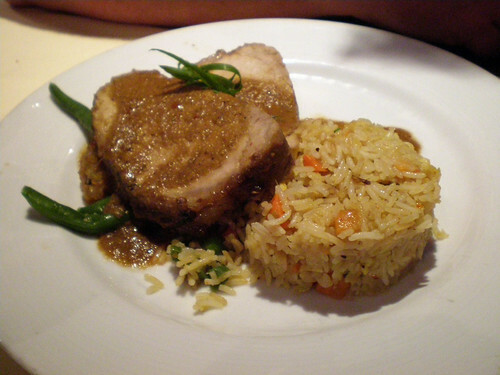 Unless you count the midnight pizza and hot chocolate in the room, that was our last meal on the Carnival Splendor. Normally we ignored the waiters when they sang (it only happened twice, and felt gratuitous each time), and we only saw the magician (Tejas, and he was great) once, but tonight the entertainment was very special. As usual, I was underprepared to film it, and our normally perfect table was the worst place to try (being under the staircase on which the waiters lined up), and then I added to all this by swinging the pocket cam around all crazy-like, resulting in a video that is actually worse than the one with the whales, but it was such a sweet (and tearful, every time I watch it) end to the cruise, that I must share. 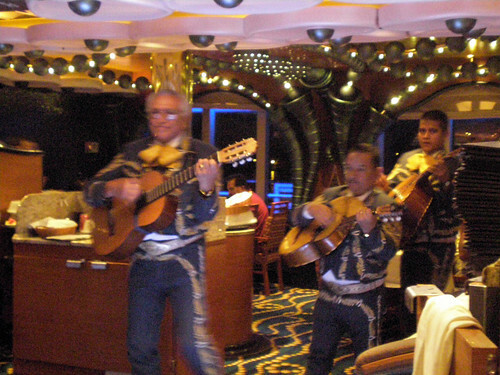 To the tune of "Leaving on a Jet Plane," this is the waitstaff of Carnival Splendor's Black Pearl dining room saying goodbye with "Leaving on a Fun Ship."